The bones and a knapping pile—stone flakes accumulated from tool-making activities —were unearthed in 2011 by heavy equipment terracing a field northeast of Scott City. Found about 50 yards apart, the bones and flakes were in the same shallow layer of sediment. 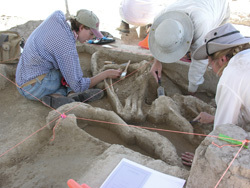 "It was intriguing to find a knapping pile and mammoth bones close together in the same geologic layer," said Rolfe Mandel, geoarchaeologist at the Kansas Geological Survey and professor in the KU anthropology department. "If we can determine that the people who created the flakes also killed the mammoth, it will prove that humans were in the Central Plains much earlier than currently proven." Although radiocarbon dating shows that the adult mammoth at the Scott County site lived 15,500 years ago, the adjacent stone flakes are impossible to date. 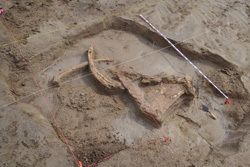 Therefore, direct evidence, such as artifacts among the animal's remains or butcher marks on the bones, is needed to prove that pre-Clovis people were in the area at the same time as the mammoth. "The question is whether the stone flakes that were exposed during terracing were really from the same elevation as the mammoth bones or were deposited in a pit dug years after the mammoth died at the location," Mandel said. "If the tractor removed the top of a pit, the flakes would be more recent than the mammoth." "We've recovered about 7 percent of the animal and are still looking for the head and teeth, which will tell us a lot more about it," Mandel said. Mandel is principal investigator of the excavation and director of KU's Odyssey Archaeological Research Fund, an endowed program with a directive to search for the earliest evidence of humans in the Great Plains. Other KU researchers involved in the excavation include Jack Hofman, professor of anthropology, and Kale Bruner, doctoral student in anthropology.